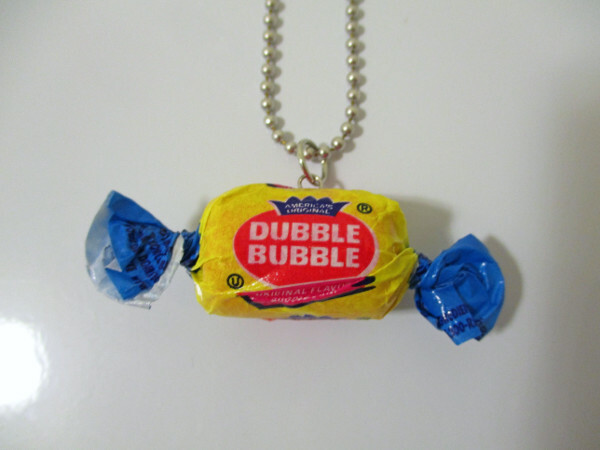 Create your own fake candy necklace using a wrapper from your favorite candy. 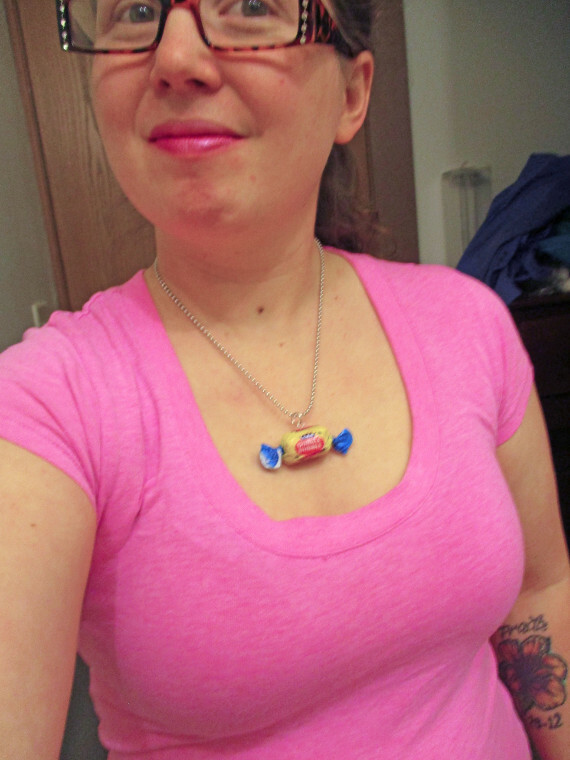 This silly necklace will trick people into thinking you’re wearing real candy and serve as a great conversation starter. 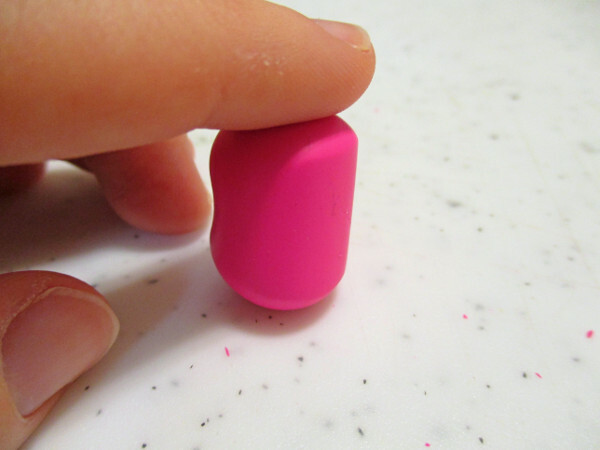 Use a clay that matches your candy and roll it into a cylinder. Stand your work up and press the ends to flatten them a bit. 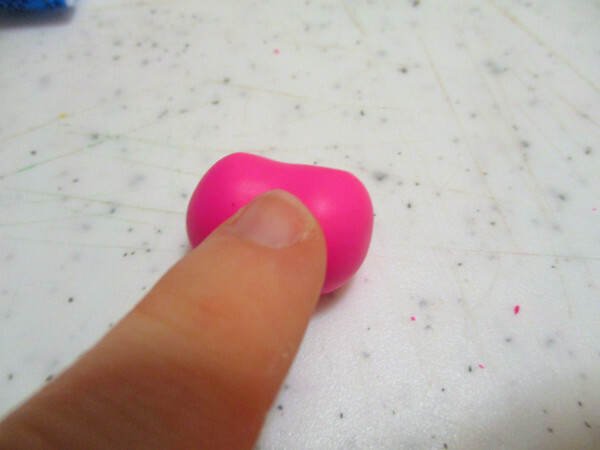 Compare your clay to the actual candy for best results. I didn’t get to do this since my 4 year old decided to eat the gum before I got to compare them. Insert a head pin in the center of your work. Bake clay as directed. I used Sculpey III which bakes 15 minutes per 1/4 inch at 275. I baked mine for 25 minutes. Position the candy wrapper around your cooled work till the front of your wrapper has a logo centered on it. 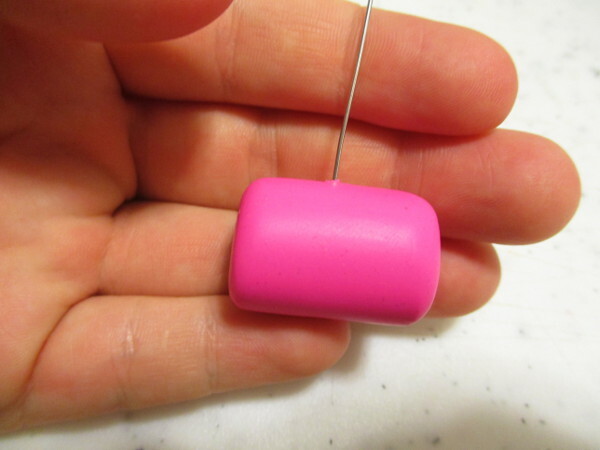 Use a craft needle to poke a small hole where the wrapper meets your head pin. Insert your head pin through the small hole in the wrapper. 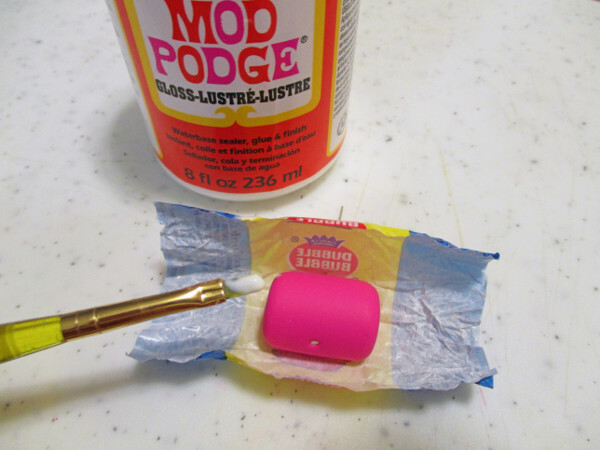 Cover the rounded surface of the gum with Mod Podge and wrap the wrapper around the gum. 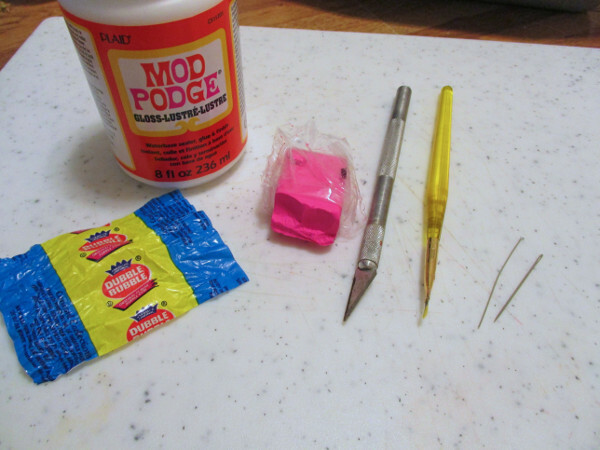 Apply more Mod Podge where the wrapper overlaps. Let it dry for 20 minutes. 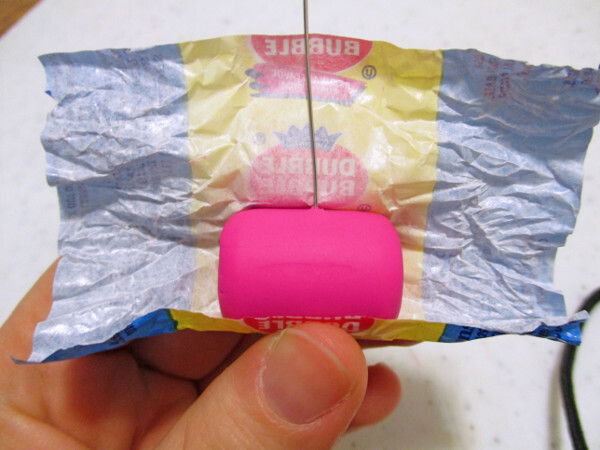 Apply Mod Podge on the flat ends of the gum and twist the ends of the wrapper back up. 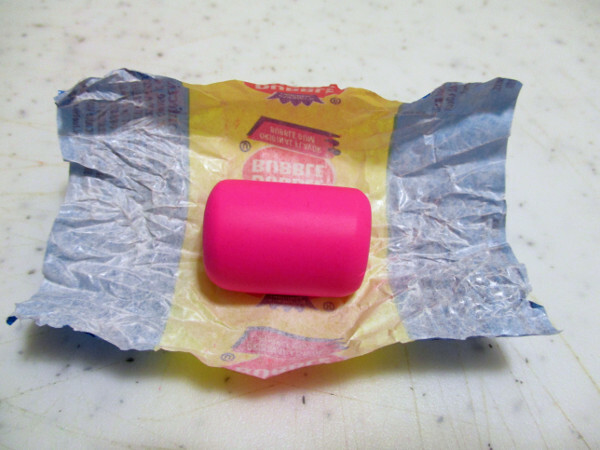 If you would like, give the wrapper a coat of Mod Podge after the ends dry. It will add a nice protective shine to your finished work. Curl your head pins with rounded end pliers, add a jump ring and add your candy charm to a necklace. Enjoy your silly new necklace. Make one and give it to your funniest friend or give it as a gag gift. This entry was posted in Clay Crafts, Crafts, DIY gift ideas, Jewelry Making, Mod Podge, Necklaces, Recycled Crafts and tagged Pendants on December 11, 2016 by Amy. Amy will be sharing with us polymer clay tutorials, tips, and techniques, as well as an occasional general craft project. She is always thinking of something new and fun to create. She loves painting, drawing, origami, and clay sculpting. Amy is a mother of 2 beautiful girls who lives in central IL. Her hobbies include spending time with her family, crafts (of course), reading, spending time outdoors, and watching 80's and Disney movies. Amy loves to live life colorfully. Her motto is "anyone can craft". She is excited to be able to share tips and tricks with her fellow crafters. Amy is always happy to receive comments and answer any questions regarding her blog posts. Check out more of Amy's jewelry and buy some for yourself at her Etsy shop, DangerousRainboCraft.